I mainly use them for gardening and cleaning jobs, they are very strong and durable. I would recommend to anyone who wants to keep their hands clean and dry. To keep my hands dry and prevent infection. Good quality gloves which we use in our Community Breakfast Club kitchen to maintain hygiene standards. Would recommend this product to anyone working in the food industry. I mainly use the gloves for dirty jobs around the home. Anybody who wants to know. We have used these gloves for cooking and gardening, good quality and easy to put on and get off. Gloves are of a good size so are easy to put on and take off. Purchased the powdered gloves. Am yet to use them in practice, but so far so good. Purchased as part of food contamination barrier.when serving cricket teas, and handling money. As described. Easy to use. Recommend to anyone who has regular dirty jobs to do. Use the product as I have horses and everythig is a 'messy' job, they keep my hands clean and sterile. Quality of gloves as described perfectly. The gloves were used by my wife for general household use. The quality is very good. I will order again in future. We use the gloves for bathing the dog. 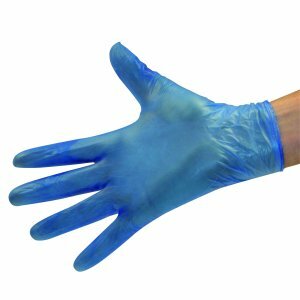 Excellent price for a disposable glove, would recommend. I use these under my gardening gloves, very tough and strong. Quality good. Being used whilst dyeing fabric and fibres. I use these gloves for applying cream, preparing food especially chicken, marinating meat, handling garlic etc and for colouring my hair. They are very useful for going from one job to another eg. if you are in the middle of preparing food and have to change a baby's nappy wearing gloves avoids contamination and it saves time. I'm a full time carer for my severally disabled daughter the gloves are fab when I attending to her needs. Simple and exactly what I was looking for.